Logbook of Winged Monkeys: Moster Classic starter pulley issue and fix. Recently we came across an issue with the Moster Classic pull starter. 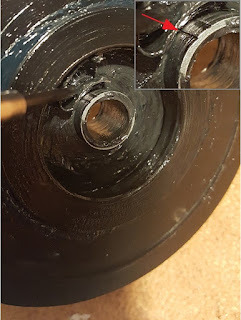 I replaced my old starter pulley system with a new one and within a few flights I got a problem. The cable stopped retracting after pulling. This situation can quickly become unsafe as my Moster has no clutch and the cable can easily damage the prop if it is loose. 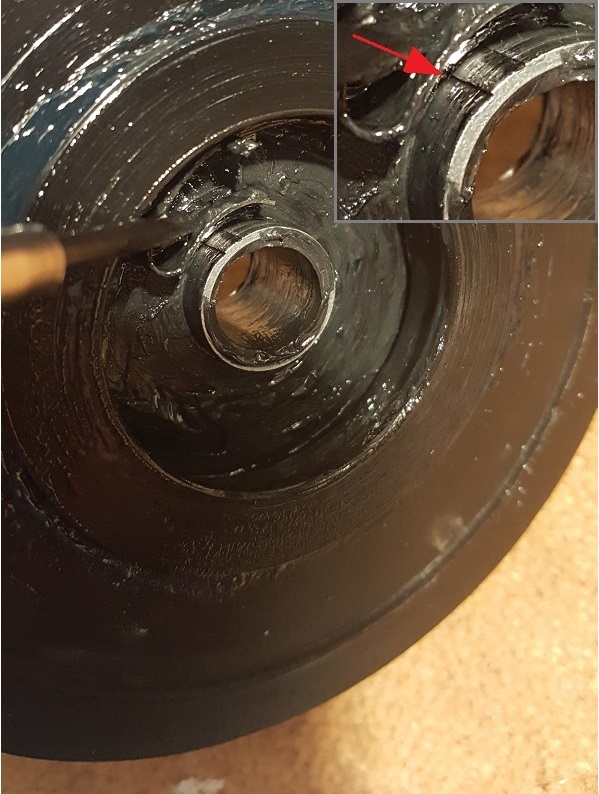 When I disassembled the starter I found a defect (groove) on the axis of the starter. It was preventing the spring from rolling backwards when retracting the cable. You can see the defect on the photo below and the evidence of what was happening. 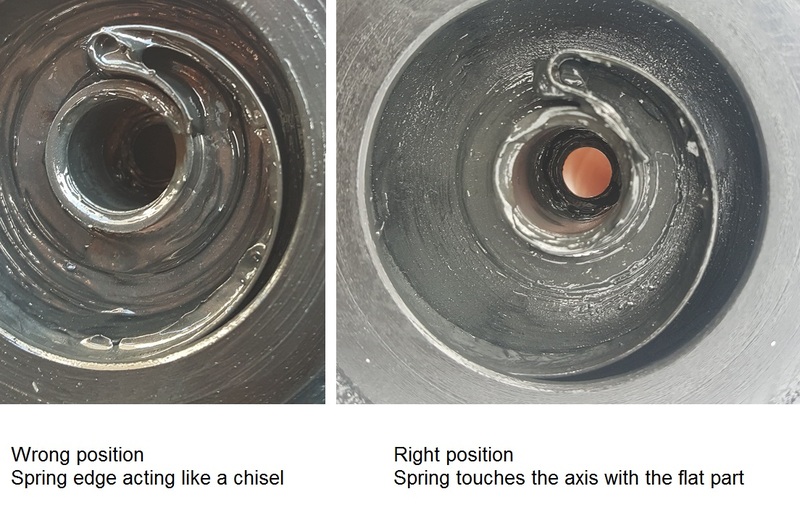 When you pull the starter (scheme 1) the axis is rotating clockwise and the spring is not touching it. 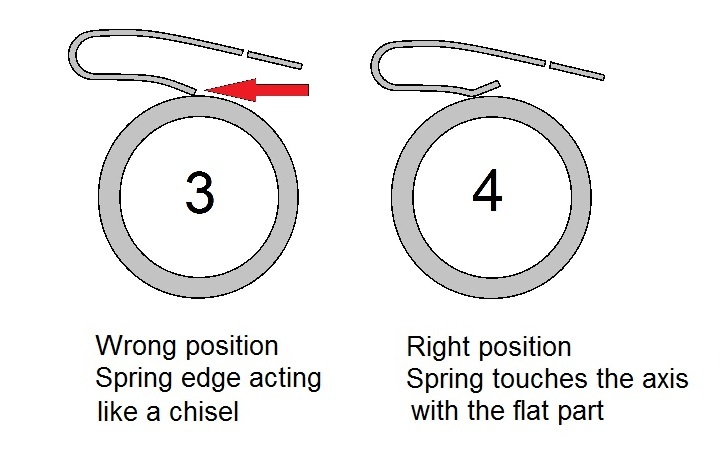 But when you release it the axis is rotating anti clockwise, the spring edge is getting trapped into the groove and stopping the axis from further movement (scheme 2). I have polished the groove out but surprisingly after a few flights the problem developed again. When I disassembled the starter again I found the same problem with the same defect. At this point I realized that the problem is not in the defect itself but is the spring. The spring is made of hardened steel and the starter’s axis is made from relatively soft aluminum. Therefore, the spring edge when unrolling was acting like a chisel cutting the soft aluminum (scheme 3). The solution of this problem is pretty simple. 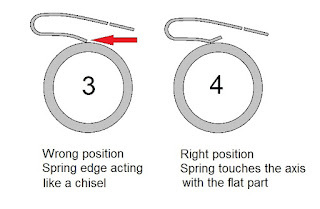 All you have to do is to gently bend the spring (scheme 4) so when retracting it will not touch with the sharp edge but with the flat bent part. I took a couple of photos as well to show the right and wrong shape of the spring. Since then the problem has disappeared and never come back. We hope this might help somebody to have a safe flights.